In a statement, campaign group Amazon Watch said "the battle is not over". 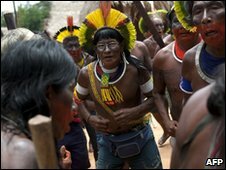 "We are committed to supporting Brazilian indigenous peoples who have vowed to fight to stop the Belo Monte dam. "This dam is one of the most destructive projects ever undertaken in the Amazon." The initial project was abandoned in the 1990s amid widespread protests both in Brazil and around the world. 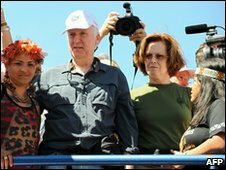 Canadian film director James Cameron and US actress Sigourney Weaver are among the high-profile opponents of the project. The government also says the scheme has been modified to take account of fears that it would threaten the way of life of the indigenous peoples who live in the area.